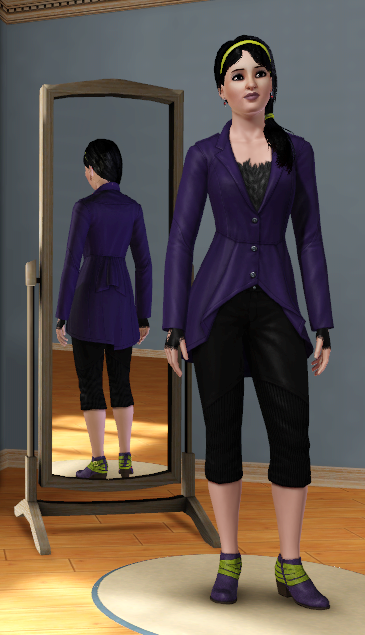 When a Sim grows into another life phase, the computer makes up random new outfits and - much to my dismay - saves it over the existing ones. When Elaine grew up to be a young adult, I thought it was time to give her a proper look. All her time tagging walls and making ground murals got her more interested in art and she slowly lost interest in skulls, roses and working in the deep night on the graveyard (she came home with a terrified moodlet each day, and street art turned out to be more rewarding anyway). So it was time to rip the rose out of her hair and get some serious outfits going. As with all in-game fashion, I invested a ridiculous amount of time to come up with all the outfits, so I thought I could just as well post them here. Maybe it can be a source of inspiration or amusement. Enjoy! F.l.t.r. : 1) Tiger hates this outfit with a passion. So much actually, that I he kept bugging me with negative comments for the whole Saturday. Without going into specifics, I do like the bit of odd combination now and then. I guess it's refreshing that I'm not the only one having such a passion over outfits for a change. 2) This is what I imagine Elaine wearing on a cold rainy day when she's inside. 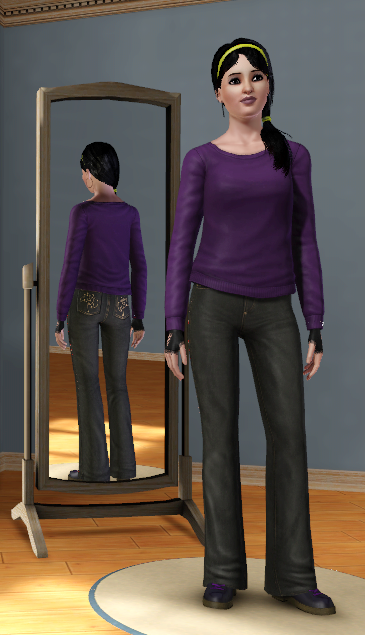 Cosy-looking but a tad rebellious on second glance with the purple boots and fingerless gloves. 3) An artsy outfit for a visit to the museum. F.l.t.r. : 4) A formal outfit that could also work for a normal day. 5) A hip outfit that could work for both formal and normal days. This might actually be my favorite of the group. 6) A chique dress suitable for a gala. My least favorite of all outfits, but will work for those occasions. F.l.t.r. 7) Sports outfit. Elaine seems to be a fan of Brazil. 8) Hip pajamas. If you stare at these long enough you'll get dizzy and fall over without any effort on your side. 9) Cute bikini slightly outside of the colour palette. Heh, I like your descriptions of the outfits. :P Some pieces I don't recognise there. I guess they're from the expansions I don't have! Also, is tagging from one of the expansions? I got the University Life, Late Night, Pets and Ambitions expansions, so some of the outfits come from there. I remember finding some new ones and being happy about it (after a bit you just have tried all the models already), but I don't remember by heart which outfit is from which expansion. I think the tagging came with the Late Night one.